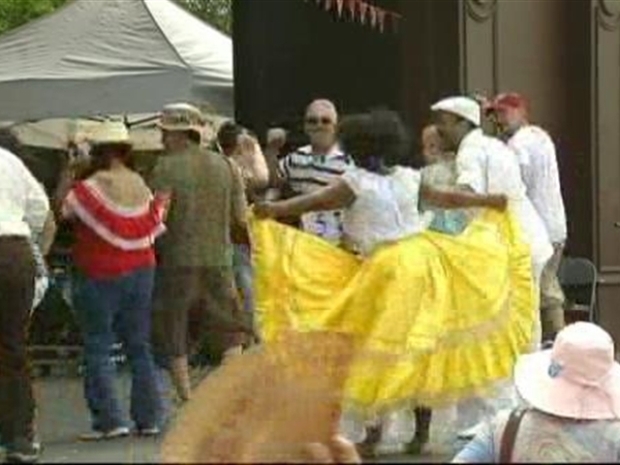 As the drums put out that seductive latin beat, the crowd took to the stage to celebrate Cinco de Mayo on the National Mall on Sunday. No matter that it was three days early. It was obvious these people were going to celebrate all week. The Maru Montero Dance Company, in colorful costumes, made it irresistlbe to join in. Folks could only sit still and listen for so long. No lack of audience participation here. And who knew so many Washington-area residents could salsa and meringue so well? It went on all afternoon at the Sylvan Theater at the base of the Washington Monument. Cinco de Mayo, which means, of course, the Fifth of May, commemorates the Mexican army's victory over the French in the Battle of Puebla on May 5, 1862. Somehow music, dance and margueritas all got mixed in to celebrate the heritage and pride of Mexican culture. Surprisingly, the "holiday" is celebrated more here state-side than in Mexico. The dancers and musicians inspired the audience to join them on stage for the Cinco de Mayo celebration on the National Mall. But back to the celebration. Sunday on the Mall set the tone for a great Cinco de Mayo celebration -- all week.